AFL: Gary Ablett's greatest threat for this year's Brownlow Medal is officially out of the running for the league's highest individual honour. 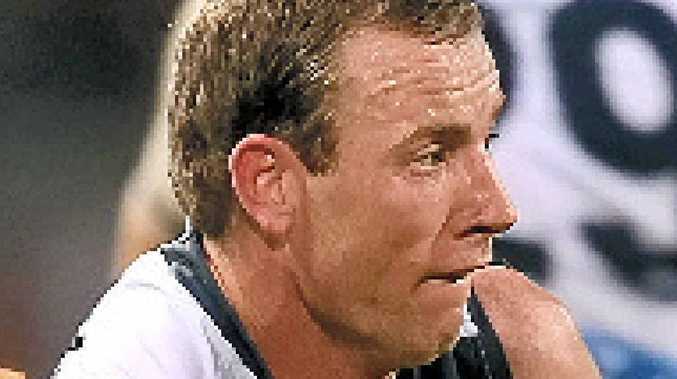 The Suns skipper's former Geelong teammate, Steve Johnson (pictured), yesterday accepted his one-match ban offered by the Match Review Panel on Monday for misconduct during the Cats' loss to Fremantle on Saturday night. Johnson headbutted Dockers tagger Ryan Crowley during another heated duel between the two players at Patersons Stadium. It will be the second time in two years Johnson has been left ineligible for the Brownlow after he was suspended three times in 2013. He still polled the fourth most amount of votes (25), however, behind Ablett (28), Geelong captain Joel Selwood (27) and Collingwood's Dane Swan (26). Johnson, who will miss the Cats' game against North Melbourne on Friday, had been clear second favourite to win in 2014 heading into last weekend's round. After another sensational display against St Kilda on Sunday, in which he gathered 37 disposals and kicked four goals, Ablett is now $2.05 (with Sportingbet) to claim a third league best and fairest award, ahead of Sydney's Josh Kennedy ($8) and Collingwood's Scott Pendlebury, Adelaide's Patrick Dangerfield and Selwood ($10). Melbourne power forward Chris Dawes also accepted his one-match ban offered by the MRP for striking Richmond defender Alex Rance on Saturday.